In a small bowl combine honey, olive oil, soy sauce, vinegar and sriracha. Stir well to combine. 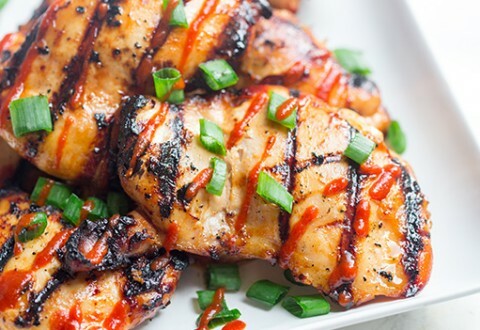 Place chicken thighs in a container with a lid and pour honey sriracha marinade over the chicken. Cover and refrigerate for at least 30 minutes, up to overnight. Heat the grill to medium-high heat. Place chicken thighs on grill and grill 8-10 minutes on each side, with the lid closed, or until meat thermometer reads 180 degrees. Serve drizzled with more sriracha, if desired, and topped with green onions.